Here’s the fourth Usok #1 author interview, this time with Crystal Koo, author of “The Startbox“, which now has an illustration by Kevin Lapeña. Given the theme that was set as a guideline for the issue, I actually started writing a completely different story, a very science-fiction one with a lot to do with computers. But I was having really big trouble with it, so one midnight I just abandoned it and started writing this one, without any planning at all, and for the most part of the first draft, it wrote itself. Making the main character’s transformation credible. I started off scribbling bits and pieces of things on lined paper and stapling them together into a “book” when I was a little girl. I can’t remember any of those. The earliest that I can remember is the first story I ever typed on a computer – something about a Molly. What I write, yes (the how is mostly influenced by the books I read). It’s a bit complex writing as a Chinese-Filipino who’s moving around Asia at the moment, so all kinds of considerations crop up, but most of the time I just make sure that I don’t pigeonhole myself into writing about one particular culture all the time. “The whole business of writing is to live with doubt: to do what you don’t know how to do, to place yourself continually in a situation of ignorance and inelegance” – Peter Carey. Not exactly advice, but it’s very reassuring, especially from a big guy in the business. Here’s the fourth, and final, Usok #1 interview, featuring our youngest author in this issue, Celestine Trinidad. Celestine is the author of “The Coming of the Anak-Araw” which now has an illustration by Benjo Camay. I had originally written a story about a storyteller (the same character in my story, “The Storyteller and the Giant”) and his apprentice, and that was the story I was supposed to be writing for the Palancas, but it ended up too long that I eventually decided to just turn into a novel—which, as with most ideas, had a life of its own, I swear—morphed into a series in my head. In that series, the storyteller and his apprentice will eventually face the same anak-araw that appeared in “The Coming of the Anak-Araw”, and they will be helped by other characters found in this story. I guess this is sort of a prequel to that, of sorts. That is, if I ever get around to writing that series. As Pao can probably attest, this story was very different originally, before he did some wonderfully extensive editing, hehe. Mostly I struggled with the pacing of the story, since in my head it was already part of that series of books I wanted to write, but this is a short story, and hence should be written differently. I think I wrote a short story (complete with really horrible illustrations, hehe) about an alien woman whose planet was destroyed, so she sought refuge on our planet, and became a teacher. I…think she battled the aliens who destroyed her planet? And fell in love with this human co-teacher who guessed her secret, probably—I always was a sucker for romances like that. I lost the original version of that story, alas. Of course, as mostly I like writing about Philippine mythology, and those stories are the ones I am most comfortable with writing. I find our myths on the whole really fascinating, and love how you can play around with them, reinterpret them in so many ways. Being a doctor also influences my writing, because I always tend to include medical-related things in my stories (Sari is a healer in this one, after all, and works with herbs I once studied), I guess these are things I can’t help either. From my former Creative Writing 10 teacher in UP: “Keep reading and writing. Don’t let what other people say stop you from doing so.” It’s really simple advice, I know, but whenever I face rejections and feel like I can never be any good at this, I remember all those workshops we had with him, when he always found something nice to say about what we wrote, while still offering advice on how we could make those stories better. He was never harsh, and I’m immensely grateful for it. I’ve kept on writing, because of those first lessons I learned from him. I think we can all agree that these artists have done a fantastic job. Thanks to Tey and Benjo, and especially Kevin for helping arrange the art despite his busy schedule. The second thing I’d like to announce is that I’m changing Usok’s release schedule. I’m sure you’ve all noticed that we haven’t managed to keep to our quarterly release schedule, and the reason is simple: we just haven’t received enough stories. I’m holding on to one story right now, and working with an author on another, but that’s the grand total of publishable stories we’ve received in the roughly six months since we launched. I’ve tried soliciting stories as well, but, as every writer knows, it can be hard to determine when your muse will behave, and when he/she will go on extended vacation in Alaska. So, as of now, Usok will be a somewhat irregular publication. We’re still open for submissions–so please do submit–but based on half a year’s worth of experience, I simply won’t know how long it will take before I can get enough stories for an issue (my magic number is at least three, but I may need to make an exception soon), and I hate labelling Usok as a “quarterly” magazine, then watching the quarters wave gleefully as they pass me by.The good news is that I hope the more flexible schedule will allow future issues of Usok to launch complete with illustrations from the talented CG Pintor crew. That being said, I realize that more could be done to encourage story submissions, and to improve the quality of these submissions. While I don’t have the time to run a permanent forum based workshop (something that would provide a venue for critiquing such as the one which indie komplex provides for komiks creators), I’ll try to brainstorm some method by which I can provide some critiques for spec fic writers who want to improve their work. Thanks for supporting Usok so far everyone, and please continue to support it in the future. There’s no real way to learn some things except through experience, so I’m having to learn a lot “on the job”, so to speak, but I promise I’ll keep soldiering onward. The website is still a work in progress, but Charles Tan, of the Bibliophile Stalker blog and a few hundred (minor exaggeration) others, has announced that the ebook version of his new reprint anthology, “The Best of Philippine Speculative Fiction 2009″ is now available for free download. You can choose from either the PDF edition or the EPUB edition. (If you have the Stanza desktop ebook reader you can export the EPUB file to different file formats–say, if you want a .mobi file for your Kindle/Kindle reader, although such conversions usually junk the formatting). The anthology has cover art Elbert Or, a cover design by Adam David, (who also did the PDF layout and design) qith the Web and EPUB layout handled by Dominique Gerald Cimafranca. Sixteen stories from fifteen authors, selected by one of the most well-read and difficult-to-please critics in the country–all for free? What are you waiting for? 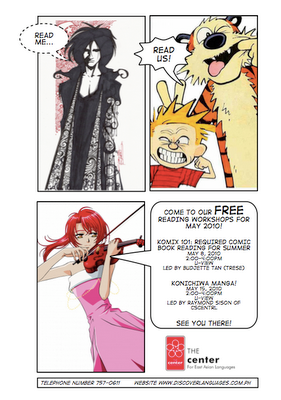 The Center for East Asian Languages is holding a seminar entitled “Komix101: Required Comic Book Reading for the Summer” that will tackle recommended comic books and graphic novels, for those looking for something to read this summer. Your guide on this little tour will be none other than Budjette Tan, co-creator of Trese and comics/komiks aficionado. This seminar is for free. On May 15, a similar seminar will be held covering anime and manga, to be run by Raymond Sison, also from 2-4, at the same venue. Estranghero Press has released a call for submissions for their newest anthology, and, as expected, this time the genre is science fiction–specifically science fiction featuring Filipino characters or the Filipino race (note that this criteria was not present in either their horror or secondary world fantasy anthologies). The title of the new anthology is Diaspora Ad Astra, and you can check the submission guidelines here. Over at indie komplex, Mervin Malonzo has announced that his new webcomic, “Tabi Po” has officially launched as of today, with the first six pages having been posted online. Now, this komik is not for minors, nor for people who have weak stomachs (so you can tell it’s also NSFW), but if you don’t fall under either of those categories, the art alone makes it worth a visit, as you can see from the teaser page below (with the NSFW bits cut out). “Tabi Po” will feature, in Malonzo’s words, “mga tauhang tiyak na iyong kagigiliwan – mga aswang, maligno, lamang-lupa at iba pang kagiliw-giliw na mga nilalang” so I’m sure it will interest readers of Rocket Kapre. From the looks of it, the posting schedule appears to be once a week, every Monday, so check back after voting next Monday for some new pages. Good to see more Filipino artists putting out webcomics, which I think are a great way to build an audience.